I’ve been focusing a lot on story recently—specifically as it relates to illustration. More and more I notice that my own work, as well as much of the work I see online is all form and no function. Or in other words, nothing more than pretty pictures. Now there is nothing wrong with great visuals (of course). Some work is all about the visual appeal and that’s totally cool. You could call it art for art’s sake. But when we look at illustration used in a design setting, it has a job. Be it selling a product, delivering a message or telling a story, using illustration in this context is about more than looking good. So I got to thinking; “How can I make my illustrations better at their job?” Or put another way, “How can I make not just pretty pictures but interesting ones?” After looking at the work of many concept artists, a profession that definitely embodies drawing with a purpose, I had a thought. If I put more work in before I started drawing I believed I would get better results. Let’s say I’m hired to draw an owl. Sure, I could look up pictures of owls, read their Wikipedia page and draw up something that looks nice. But if I made some decisions about who this owl was before I drew it, would that make for a more interesting character? What if I gave it a personality? What if I decided how old it was? What if I gave it likes, dislikes, fears, dreams, etc.? Even if the brief didn’t require it, would it make sense to add some backstory? And that’s where the pirate test came in. The pirate’s name is Edgar Bushybrows. He has been stranded on a tropical island for the past 2 years after a hole in his boat gave him no choice but to find the nearest piece of land. It’s easy to assume that years on an island has made Bushybrows’ brows much bushier. He has no surviving crew, no change of clothes (ew) and only enough food to make it through the first few days. But that hasn’t stopped him from putting on a few pounds due to his new-found love of coconuts. Edgar spends most of his days on the island making sand castles, racing crabs and trying to catch fish — only to settle for more coconuts when he realizes how poor a fisherman he is. Life on the island has really mellowed Edgar out. He is a lot more peaceful than he was in his previous life of pillaging and plundering. While he feels that he should be trying to get off the island by building a raft or something, he’s in no hurry. I’ll admit that this isn’t the most scientific experiment ever conducted, but that’s okay. I figured it would be fun to do, fun to review and that by comparing the first and second drawings we could get some interesting results. Here are my observations. 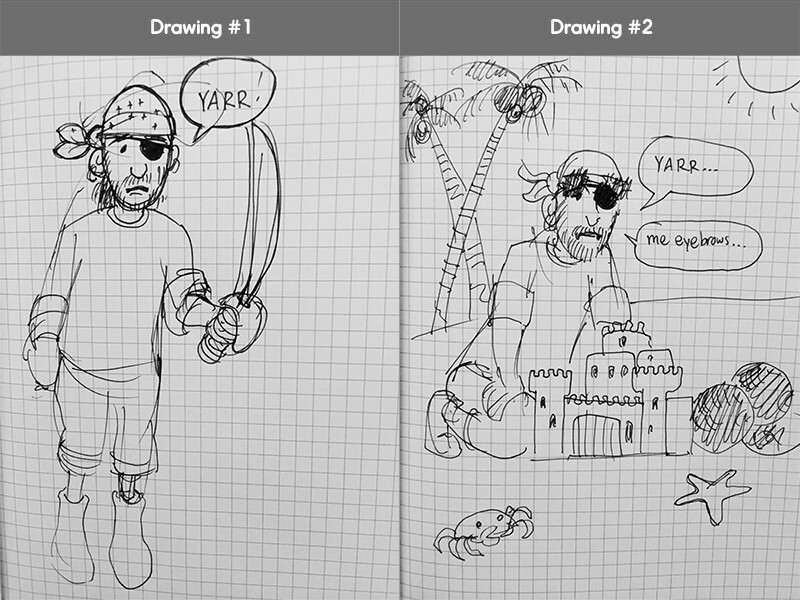 The brief never changed—draw a pirate. I said nothing of environments but that didn’t stop many people from adding one in for the second drawing. Just mentioning that our second pirate was on an island caused many of the artists to include it in their sketch. If our goal is to make a drawing that is more interesting I see this as a big win. Because I’m sure you’ll agree, a character that lives within an environment is much more interesting than one that floats in space. Even though the brief was to create a character, that isn’t all we got. A great example of how context can take a pirate from standing in place to on the beach building a sandcastle. We get so much more in the second drawing than a character—we get a story. Once we have more information about the pirate—that he’s calm, likes to race crabs, eat coconuts, etc.—we see those elements show up in the drawing. And what’s cool is that they take many forms. We see heart-shaped eye-patches, sand castles, fishing rods, crabs—even some coconut underwear. These are the kinds of things that will have the viewer asking questions. And I’d argue that if the viewer is curious, you’ve done a fine job. It’s the subtleties like the heart shaped eye patch that really sell the character here. A coconut in hand and a crab on the belly make the character that much more interesting. A fantastic example of how a traditional pirate drawing has been altered to fit the characteristics of our second brief. 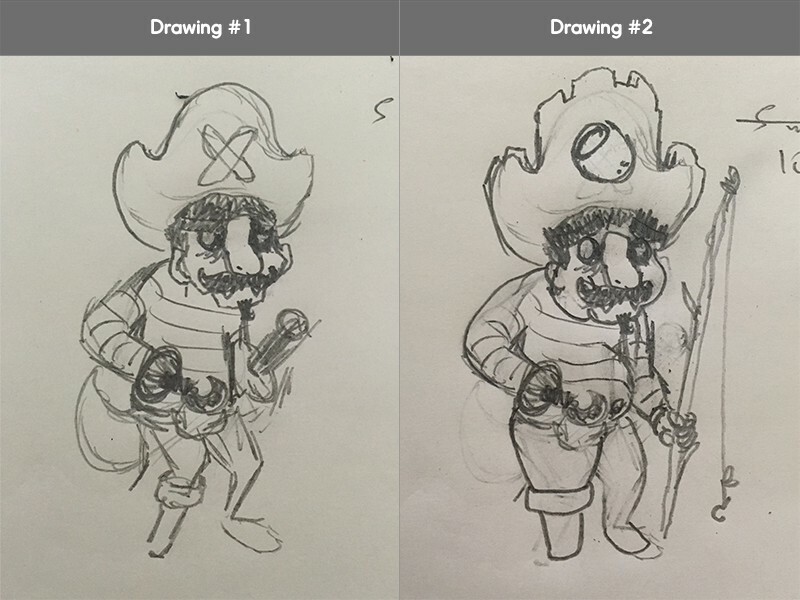 When I asked our artists to draw a pirate most of what I got was one just standing still. But add a bit of story to the character and suddenly he is sitting on the beach, gathering wood, fishing, building a sand castle and chasing crabs. Just as a character hanging out in empty space is less interesting than one in an environment, a character who is doing something is far more interesting than one who is standing still. Again, I did not ask for this but people subconsciously drew their pirates this way just from the context that was provided. Again, I’d call that a win. The two characters visually look quite similar yet you can tell so much more about the second one’s personality. This artist took the jump from a portrait shot to an entire scene. The pose says it all here. To me this is the most important point. When we think of a pirate we think of some very specific things; eye-patch, peg leg, parrot on the shoulder, angry, etc. In the first drawing, that’s almost entirely what we got. But, once we learn more about the character, we see some deviation. Now our pirate isn’t just angry—he’s happy, sad, relaxed, etc. He doesn’t fit one physique but gains weight in some cases and looses it in others. Rather than having a parrot, one pirate is a parrot. People like unique and the generic pirate isn’t. Give him more personality however and he gets there. On the left we have what we would expect from a pirate and on the right what we wouldn’t. While the second drawing still definitely reads pirate, the subtle changes from the first give him more character. This artist gave us two great examples of different directions you can take with a pirate. If our goal is to create an illustration that engages people, we want to serve them up something different. We all have similar ideas of what a pirate, wizard, knight, etc. looks like. And chances are that unless we put some thought into our illustration beforehand, the generic interpretation is how it will turn out. So, let’s add some story to the mix. Regardless of whether any one ever learns that the character you’ve drawn likes pickles, if that decision makes you drawing more interesting, you should make it. And what I’ve discovered since putting this into practice is drawing this way is a lot more fun. I want to thank everyone who participated in the experiment. I had such a great time looking through your drawings and I hope that this information is as helpful for you as it is for me. For the curious, all of the submissions can be seen here. This experiment has served as great fuel for a new course—Character Design with Story. If you want to dive even deeper into these ideas, I recommend checking it out.